Updated Thursday February 16, 2017 by Kitchener Sports Association. 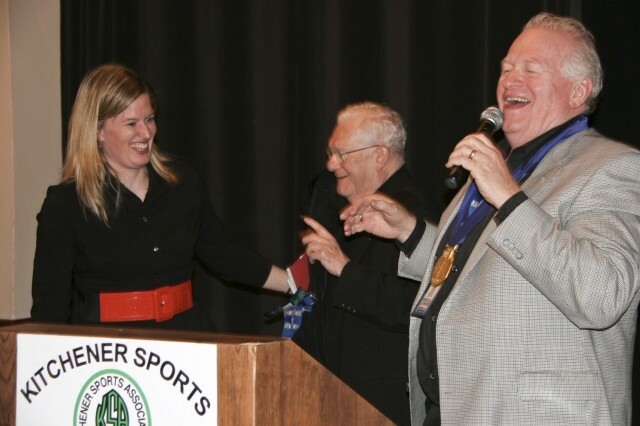 PHOTO: (L-R) Canadian Olympian Sami Jo Small, Father Bernie Hayes and MC Neil Aitchison share a few laughs over the gold medals Neil is claiming should/could be his ..... in another world!!! In addition to hearing from Sami Jo -- and getting photo'd with her and local hockey-- Jim Hallman purchased the set of souvenir 1972 Olympic medallions donated by Olympian Alf Mayer to the auction in support of the KSA Olympic Dreams program. Father Bernie Hayes said grace before the dinner and shared chuckles with John Thompson who chaired the event organizing committee. The event also featured Neil Aitchison who entertained everyone throughout the celebration and "tried on" Sami Jo's gold medals.